RESCUE and SocialMoms may compensate me for sharing my thoughts on life's stressful moments and how I combat that stress. One word can encompass the complexities of life, stress. Some people thrive on stress, chaos, or other craziness. Unfortunately, I am not one of those people who thrives with stress. When life overwhelms me, I shut down. My energy becomes depleted; I lack patience; and I want to bury my head under the blankets. (or drink a glass of wine while locked in the bathroom because the kids can't go in the bathroom with me). Any of these activities are not productive and actually can cause more stress because I'm only prolonging the must-do activities. So when stress takes over, what can you do? Some people subscribe to the idea that exercise can help reduce stress. I agree. A yoga class, kickboxing class or even a sweat inducing run can leave me energized and ready to face the day. Putting aside the mid-afternoon aches and pains from the activities, a good workout can get me to jump start the day. Knowing that I can tackle the arduous workout that pile of laundry or the next swim meet packet isn't that intimidating. While the workout concept can be great, what if you can't find that 60 minutes or even 30 minutes to workout. The stress still happens, so how will you combat it. One effective way is to add some specific nutrients to your diet. Of course, everyone knows the importance of eating more fruits, vegetables, whole grains and daily water intake can be to overall well-being. But, did you know that certain herbs and plants can help reduce stress? Adding some specific herbs to your diet can help combat life's stressful moments. The question becomes how can I easily add these items to my diet. I can't put stress on the calendar and plan a delicious meal incorporating a stress reducing pesto. Anyone who is busy, has stress or just deals with life, knows that stress comes when we least want or need it. So in these specific moments, what's the solution? An easy to to help combat those overwhelming moments is with RESCUE. RESCUE is a brand of over the counter herbal remedies to help combat life's stressful moments. RESCUE uses the following herb/plant combination to fight stress. For life's overwhelming situations, RESCUE can help to alleviate the instant panic in the moment. Keeping a container of RESCUE Pastilles in your purse, car or desk drawer can be a way for your to remember to stop, breathe and let the pastille help you find a sense of calmness (or maybe just a little smile because it could be worse). 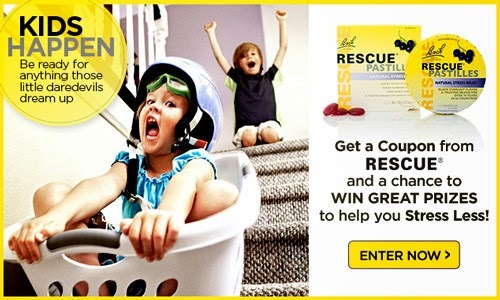 Right now, RESCUE is offering a BOGO coupon. It is available at Walgreens, Whole Foods and other retailers. RESCUE has several products in its stress reducing line. The next time that stress wants to make you hide in the bathroom and pretend that life's daily chaos has disappeared, grab RESCUE and think about a relaxing massage on a deserted beach. Everyone can be on her way to stress less. I workout every single day because I need that time alone to regroup. I am a better mom for it. I love to have my down time and I am a better person for taking care of me, too. I like taking walks to relieve stress. I get in my exercise and feel better. I have to try this... I love treating stress naturally. I feel like I live in one major stress filled existence. These sound like a great way to de-stress naturally. I have these, the Pastilles. As a mom to 5 they are so needed! I have had a lot of stess in my life lately. I need to find this to help with the stress. It is important to have a few tips and tricks in your pocket to help you manage stress better and be able to decompress. I recently tried the RESCUE pastilles and I find them to be super helpful. I keep them in my purse. I love this stuff. I have the black currant pastille in my bag! I had never heard of these, but now I'm glad I read this post! I agree that exercise and taking time for oneself helps combat stress, but also true that not everyone has the time or energy to do as much. Thanks for introducing me to this product. I may try this. I shut down too. A lot of times I go to bed and then the depression sets in. This sounds like a good thing to try. Alike you I shutdown and am trying to find ways to alleviate this. Rock Rose sounds like something I would try. Thanks! I need to try the Impatiens for patience & tolerance . Great Post! Will have to use the BOGO coupon and try some of this. Thanks! I would like to try the Star of Bethlehem. Thanks for a great review. Thanks for the information. We have stress in our lives. LONG hot bubble baths relax me, the absolute best is prayer! Sometimes its good to just take a nap! I have never thought of taking something herbal for stress. I often tell my clients to do things to combat stress. I will have to see what the reviews have to say about its effectiveness. I've heard about these on some other blogs as well and was curious if they really work. Will have to try them out. I love that this allows for a chance to regroup. I plan on bicycle riding when the rain slows down in Texas. I've used herbs before to decompress but never knew there were so many! I think everyone needs some time to breathe and destress. Treating stress naturally is the way to go! I need to find some new ways to ease stress. I have lots of stressful things going on right now. I love a nice bath in lavender...seems to sooth. This sounds great to relieve stress. I think that one should take at least 15 - 3o minutes a day to decompress. Thanks for the Fantastic Review on #StressLess2BMyBest RESCUE, combating life's stressful moments one pastille at a time! I was happy that you brought this to my attention and will definitely be checking it out.I love to go walking and take a nice long relaxing bath but like you sometimes that is just not possible. Thanks for the great review! I've heard of this before have yet to ry it. I try taking at least 30 mins daily to decompress. I have real issues with stress and Ito ill shut down. I didn't these plants could be used for stress relief. It's worth a try if you can't work out or walk. Like you review, and will most definitely have to try RESCUE out. I try to take some time out daily, even if it's just 5 minutes, to relax and breathe and get away from it all. Even though I try to decompress, at times I'm overwhelmed. I will have to try this out. I need to look into the fact that certain herbs and plants can help reduce stress. I think a lot of us take more time than normal in the bathroom to decompress :) Rescue sounds appropriate to alleviate these feelings. I get stressed out pretty easily. This seems like a great idea. I have history of stress and anxiety and this natural approach sounds like something I might try. Would love to try the Star of Bethlehem. Thanks for the post. I love listening to music and workout to relieve stress. thanks for the post ! This has been made into a great post for guys and gals; especially those like me... For we can never lose hope for there's always some form of exercise around the corner. My moral guidelines had been often put in my hands when my mother taught me to do some form of fitness daily. In addition, I and my mother... both are unable to work because of injuries --- mine from an accident & her's from the military - where she's not getting all the benefits she deserves! Working out and taking a little time for myself daily is what helps me decompress. I have to have my quite time for myself. Seeing as these are natural, it's great to use to relieve stress. I would like to try out the Rock Rose. Thanks for the reviews. I think I would like to try this.